Having earned a degree in Foreign Languages from the Faculty of Arts and Philosophy of Salerno University, I worked for 13 years as an executive secretary. In 1999 in order to devote more time to my family I became a freelance translator and now mainly work in the Italian publishing industry as a translator and editor. Thanks to my mixed heritage (Italian, British and Czech) I soon found out that one of my life passions was interpersonal communication. Ever since I was a child, I discovered I had an innate desire to research and experience the spiritual side of life and a keen interest in what happens after death. I am an astral traveler and have always actively researched the Afterlife and the circumstances that enable the physically living to contact discarnate spirits. Since 1994 I have worked as an interpreter at professional mediumship training events in the UK and Italy: here I gained first-hand experience about the mechanics and philosophy of mediumship. I also team up with other Afterlife researchers in the field of after-death communication. Owing to my interests, I have met many bereaved people and have developed a specific interest in grief support. I devote a substantial part of my free time to comforting the bereaved, irrespective of their cultural or religious backgrounds. So far, I have published two books in English and three in Italian. Just as my blog articles, these are designed to share my understanding on such spiritual matters with an emphasis on self-help. The key to understanding the writings of Giulia Jeary Knap - and especially her book, Looking Beyond the Fishbowl: A New Comforting Perspective on Reincarnation - is her fundamental conclusion: “I … consider human beings as powerful multidimensional spiritual beings, regardless of our physical circumstances.” The primary implication this bestows on her considerations of the afterlife, this life, and the experience of multiple lives, is that reincarnation should not be seen as a linear depiction of multiple rebirths. That is, from our spiritual being’s point of view, each incarnation is literally but an individual aspect of our greater self, and therefore rebirth cannot be accurately perceived as one individual’s inescapable chain of single identities. This is comforting. Not only are we as individuals not chained to time as we believe; we also are not automatically doomed to live again. Others have spoken of the truth that Giulia Jeary Knap presents so well in Looking Beyond the Fishbowl, including John Brooker, Jane Roberts in the Seth books, and Robert Moss, and Knap neatly summarizes their contributions, but unless you are a student dedicated to such matters, you may not be familiar with their names. The beauty of Knap’s book is how she manages to make a great deal of this complicated material readily accessible (and even experientially available) without “dumbing it down,” offering in contemporary terms a distillation of much previously esoteric information. In fact, her writing is concise and precise enough to make any complex notions seem downright self-evident. In the end, Ms. Knap provides one of the most coherent and internally consistent perspectives on being and reincarnation I have ever read. Looking Beyond the Fishbowl: A New Comforting Perspective on Reincarnation is a nonfiction spiritual/supernatural work written by Giulia Jeary Knap. What happens after death is a subject that has engendered hopes and fears for many raised in the Christian faith. The heaven one learns about in Sunday School, complete with clouds and angels, seems unsatisfying in the long run. Some also wonder about the rationale behind promising a glorious afterlife if one suffers sufficiently in this one. Feeling failed by those promises, many consider the possibility of a succession of lives, wherein one repeatedly incarnates and experiences a succession of lives until reaching a certain pinnacle in enlightenment. In this work, Knap explores the concept of reincarnation both in the way it’s believed traditionally and as something that is non-linear. She shares her views on Beyond Death Experiences and a spiritual awareness that transcends our mortality. Giulia Jeary Knap’s Looking Beyond the Fishbowl: A New Comforting Perspective on Reincarnation is a thoughtful and well-presented discussion of reincarnation and a non-linear approach to life and mortality. I was particularly interested in the after-death experiences she relates in her book and her own experiences with lucid dreaming and astral projection. Knap’s approach is neither didactic nor prescriptive; she seems open to discovering new answers to old questions and it’s a refreshing and inspiring attitude. I was impressed by the depth of the material she presents as well as the extensive bibliography she includes in her appendix. Looking Beyond the Fishbowl: A New Comforting Perspective on Reincarnation is most highly recommended. Giulia Jeary Knap’s Looking Beyond the Fishbowl is a thought-provoking look at reincarnation and our lives as Spirit beings. Based on her research into various faiths, beliefs, theories and her own personal experiences, the author sets out her case for a certain type of reincarnation: we incarnate into one main human life but have access as observers into our own parallel or alternative lives through dreams, visions or out of body and déjà vu experiences. Our true nature as multidimensional souls or spiritual beings, part of the Divine Creator or God, is hidden from us most of the time as our Egos keep us focused and obsessed with the physical, time bound life using fear, judgement and doubt to control us. We may feel trapped within a "fish bowl," but it is when we access our connection with our Creator that we realize the truth. As a novice to the subject of reincarnation, I found this book a fascinating read. Giulia Jeary Knap is an excellent writer and communicator and writes with clarity and conviction. The book is well formatted and chapters cover what reincarnation means, the ego and our real selves, the author’s personal quest, pre-birth memories and déjà vu experiences, and some summaries and relevance of the writings and theories of John Brooker, the Seth Entity and Robert Moss. The comparatively short chapters with their focus on one aspect of the author’s beliefs at a time enabled me to absorb the information and ponder the meanings, and I liked the references to the experiences and philosophies of others. Some of the author’s own experiences will sound familiar to readers – particularly dreams or déjà vu moments. More profound and stressful events such as Out of Body experiences will be less familiar to the majority, but Knap gives fascinating accounts and insights from herself and others to offer the open-minded and seeker of spiritual understandings much to consider. With its positive and sensitive tone, this book is a unique and comforting view of the meaning of reincarnation, the purpose of life and our connection with all creation as joint creators. Looking Beyond the Fishbowl: A New Comforting Perspective on Reincarnation by Giulia Jeary Knap is a non-fiction book that is part-memoir, part-spiritual/supernatural book. In this book, Giulia explores aspects of herself and her personal journey towards self-discovery. The book is divided into several chapters and each one focuses on a specific aspect of the spiritual quest—what is reincarnation, the Ego and the Self, Pre-Birth Memories and Déjà Vu, NDE or Near Death Experiences that include OBE or out-of-body experiences, multi-dimensionality in the universe, among others. There is also a chapter devoted to Giulia’s personal life journey and what her own experiences have been in childhood as well as in later life. I liked reading Looking Beyond the Fishbowl: A New Comforting Perspective on Reincarnation and as someone who has read a lot of literature on this subject, I must say I found some of Giulia’s thoughts and reflections intriguing. That being said, I also felt at times that I couldn’t agree with her viewpoint or insight. However, this is just my personal opinion and this is a field that is always subjective and hence the experience could very well be different for someone else. Her writing style is candid and free flowing. The book is fairly short and makes for quick and easy reading in spite of the subject matter, which can be a bit intense at times. I especially liked the chapter on rebirth and Guilia’s thoughts on it and hearing her point of view. Overall, this will be a good read for people interested in philosophy or reincarnation. Looking Beyond the Fishbowl: A New Comforting Perspective on Reincarnation is the second book in the Between Heaven and Earth series by Giulia Jeary Knap, a book that reassures readers about the truth that nothing is lost in this world where things are spiritually reborn. In this book, the author shares powerful insights into that journey and truths she has uncovered over the years, truths that will offer hope to those who have suffered loss. The author weaves in her personal experiences from the "time stopping" events that allowed her to understand the unity of all things, to the wonderful understanding of the power of now, to great clarity on the concept of reincarnation. There are two things that made me love this book. The first is the author’s chronicle of her personal journey in the search for truth and meaning, a journey that is communicated with clarity and honesty, and I think that many readers will find themselves in the author’s personal experience. The second thing that caught my interest is the simplicity of style and the beauty of the language. The message of the book is couched in a language that is accessible and that leaves no room for ambiguity. 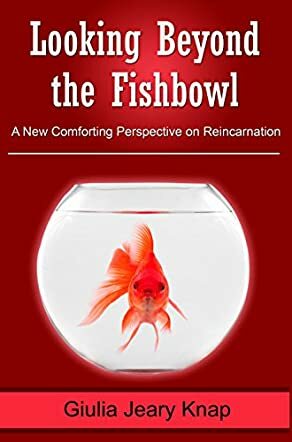 Looking Beyond the Fishbowl: A New Comforting Perspective on Reincarnation will appeal to readers with different religious beliefs and the intersection between the different forms of belief in this book is interesting. It will certainly change the way that most of us look at life and death and how we approach the experience of loss.